‘Tis the season to gather with friends and family to celebrate. Halloween is a time of spooky fun. Thanksgiving is for giving thanks and eating ourselves stupid. Christmas, Hanukkah, and Kwanzaa are full of festivities, reflection, and gifts. When people gather, games are played and what better way to enjoy each others company than a card game or two? 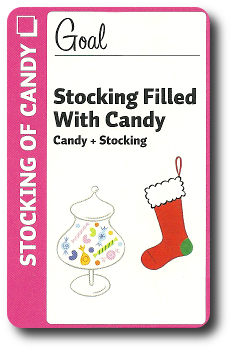 Or, better yet, a card game about the holidays and all that makes them grand, including the chaos. 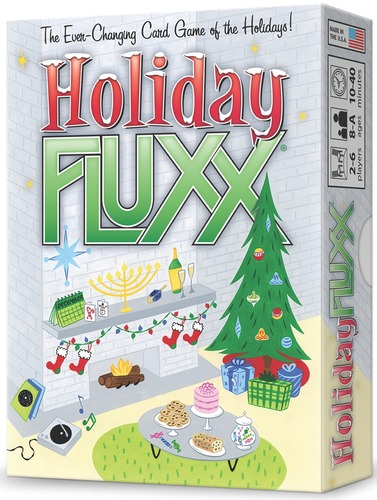 Holiday Fluxx, designed by Andrew Looney, is the newest addition to the Fluxx family of card games from Looney Labs. It’s comprised of 4 Surprise cards, 21 Keeper cards, 32 Goal cards, 18 Action cards, 24 New Rule cards, and 1 Basic Rules card. The cards are as thick as your standard playing card. The illustrations by Ali Douglass are festive and do a good job of furthering the game’s holiday theme. Note: If you are familiar with how Fluxx is played, skip to the Final Word portion of this review. 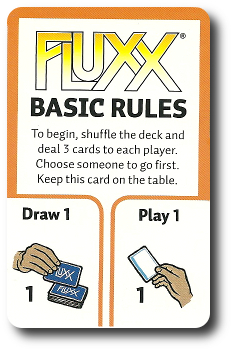 If you are new to Fluxx or want to learn how the game is played, read on. Holiday Fluxx is played entirely with cards. The different card types change the game, making certain that no two games are the same. Each card type and their use are summarized here. All Fluxx game start with 2 simple rules. On a player’s turn they draw 1 card and play 1 card. The Basic Rules card is placed during game set up to remind players what they can do. It won’t be long before this rule card is discarded, however. As the game progresses, new rules will be introduced. 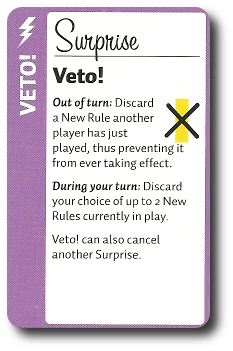 New Rule cards add and remove new game play elements, including the basic rules. Long story short, players shouldn’t become attached or strategize a plan of attack around any rule in the game, because there is no guarantee the rule will remain. 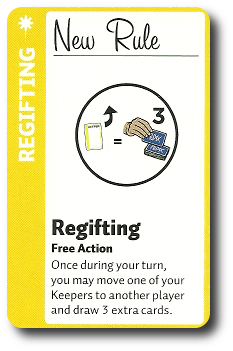 Actions cards allow players to bend the rules currently in play once and are then discarded. Action cards usually let the player do something nasty to an opponent or temporarily cheat. Goal cards define the victory condition. Since there are no Goal cards at the start of a game, no one knows what they need to do to win. As the game progresses, Goal cards will start to be played. Goals are for everyone, which means if you play a Goal card, you are also giving your opponent’s a way to win. Players complete a Goal card by playing the right Keeper cards. Only 1 Goal card is in play at a time in the middle of the gaming area. If a new Goal is played, it replaces the previous Goal card. Keeper cards are used to complete the requirements of a Goal card. Keeper cards are played in front of a player and belong to them until they are either stolen or discarded. Surprise cards can be played out-of-turn or during a player’s turn, but when they are played changes what the card does. Surprise cards are great for canceling other cards and quickly changing an opponent’s plans for their turn. To set up the game, first find and place the Basic Rules card in the middle of the playing area. This card defines the starting rules that all players must use on their turn (unless they have a card that says otherwise). Second, shuffle the rest of the cards and deal 3 to each player, face-down. Players should look at their cards, but keep them hidden until revealed. Third, place the remaining cards face-down to create the draw pile. Leave room next to the draw pile for a discard pile. That’s it for game set up. Let’s have some fun. Holiday Fluxx (and every Fluxx game, for that matter) is played in turns with no set number of turns per game. Note that what a player can or cannot do is dependent on what the current rules state. Since the rules in play are always random and changing, it’s impossible to provide a comprehensive summary of a player’s turn. Instead, all I can do is provide a basic “idea” of what a player might or might not do on their turn. Cards are drawn from the draw pile and only if a rule allows it. It’s possible to draw 1 or more cards during this step. Draw cards are placed in the player’s hand. If the draw pile is out of cards, shuffle the discard pile to make a new draw pile. The player now plays as many cards as stated by the current rule. Any card the player has in their hand is playable. If a New Rule card is played, it supersedes the old rule cards immediately. If the new rule change would have influenced the current player’s turn (for example, drawing cards), they now resolve the new rule. Action and Surprise cards are discarded when played, Goal cards are played to the middle of the game playing area (replacing previous goals), and Keeper cards are placed in front of the player. If you are pondering all the different ways the cards could be played and cause confusion, you are not alone. The game comes with a FAQ that addresses the majority of strange game conditions caused by the cards. The player now discards down to the hand size limit set by the current rules. If the player doesn’t have any cards, this step is skipped. If they have more cards than allowed, they select the cards they want to put in the discard pile. Note that these cards are not played, so any actions or rule changes they might have are not triggered. The player must now discard down to the Keeper card limit set by the rules. This only applies to the Keeper cards the player has in play in front of them, not the Keeper cards in their hand or all the Keeper cards in play. And that’s it! Well, not entirely. Recall that the rules will be changing constantly which will impact players when it’s not their turn and Surprise cards could be played at anytime to throw everyone off their game. Such is the chaos that is Fluxx. The player’s turn is now over and the next player now takes their turn. The game continues as noted above until 1 player has completed the requirements of the current Goal card by having the correct Keeper cards. It’s perfectly possible that a player could win the game by playing a Goal card that requires Keepers already in play or a change in the Goal card gives victory to one or more players simultaneously. Players could also win even if it isn’t their turn. 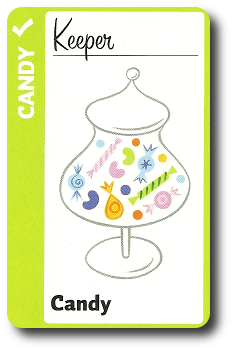 To learn more about Holiday Fluxx, visit the game’s web page. Child Geeks very much enjoyed Holiday Fluxx, finding the game to be an excellent conversation starter about what presents they wanted and how many days were left until Christmas. 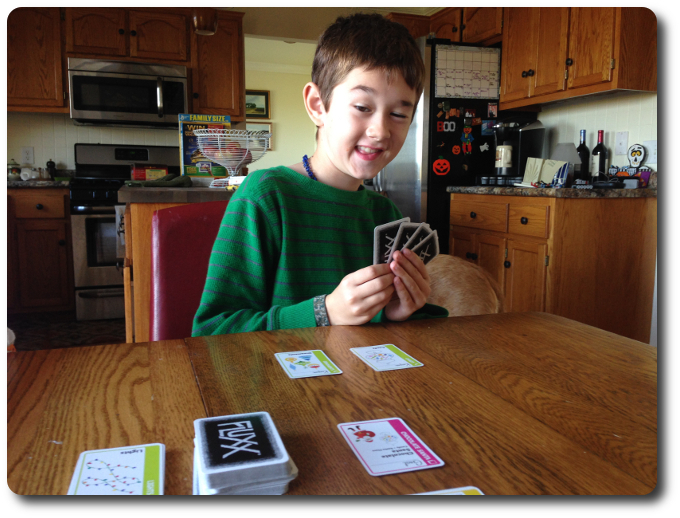 All but a few of our Child Geeks were familiar with Fluxx, but even new players quickly got “into the spirit” of the game and were playing like champs. One of the game’s great strengths is how easy it is to learn how to play and how each game is never played twice. This kept the Child Geeks coming back for more, even though a number of them were already very familiar with the Fluxx games. According to one Child Geek, “I like this game because it gets me excited for Christmas!” Another Child Geek said, “I like how you get to build things in the game, like the Christmas Tree.” When all the games were over, the Child Geeks gave Holiday Fluxx their full approval. My oldest little geek gives me some sass seconds before he wins the game. SUCH IMPUDENCE! The Parent Geeks enjoyed the game as much as their Child Geek counter parts, but rolled their eyes a bit. According to one Parent Geek, “This is just another Fluxx game, but I think it’s neat that they tied it into the holidays.” Another Parent Geek said, “Great, now I have to buy another Fluxx game. Looney Labs keeps taking all my money!” Mock outrage aside, the Parent Geeks did think that the game was unnecessary if you already owned a Fluxx game, but everyone liked the game’s theme. One Parent Geek put it beautifully when they said, “You know when you say that there is a game for every player and a player for every game? Well, what you need to start saying is that there is a Fluxx game for every occasion and an occasion for every Fluxx game.” I don’t think that’s true yet, but most likely soon. I bet we are not too far off from seeing a Fluxx game about sports, for example. This is Fluxx with a holiday theme and that’s about it. The core game is the same as every other Fluxx game on the planet and nothing new has been added. 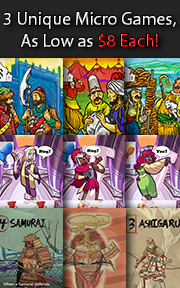 However, what this and every version of Fluxx provides, is a thematic element. In this case, the holidays which includes Halloween, Thanksgiving, Christmas, Hanukkah, New Years, and Kwanzaa, complete with festive lights, food, candy, Santa Clause, the menorah, presents, and just about anything else you can imagine that is part of the holiday season. The Goal cards use the Keeper cards as creatively as ever to mix and match different results. For example, the “Leftover Turkey Sandwiches” Goal card (my personal favorite) requires “The Roast” and the “Bread” Keeper cards. It makes sense, makes you smile, and sometimes a bit hungry. For those who love Fluxx, this newest version of the game will most certainly be a real pleasure to play with friends and family during the holidays. What better game to play during Thanksgiving than one that includes Thanksgiving? For everyone else, this version of Fluxx just provides more Fluxx. If that appeals to you, go get the game. If you think one Fluxx game in your life is enough, no need to rush to the store. And for the record, the best version of Fluxx is still Cthulhu Fluxx. Not sure how you can fit in Cthulhu this holiday season, but gamers tend to be creative people. I’m sure you’ll think of a way. I know I will. Tagged Card Games, Child Geek Approved, Parent Geek Approved. Bookmark the permalink. I just discovered your game review website and am very much enjoying reading your reviews. I am now just dropping a note that you have a typo. 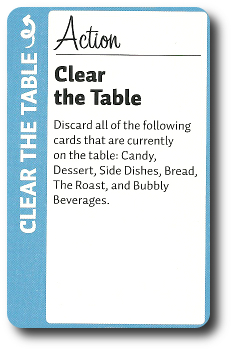 Change ‘but’ to ‘bit’ in this sentence: For example, the “Leftover Turkey Sandwiches” Goal card (my personal favorite) requires “The Roast” and the “Bread” Keeper cards. It makes sense, makes you smile, and sometimes a but hungry. Thanks for reading the review and leaving a comment, Reed. Greatly appreciate you letting me know about the typo, as well. 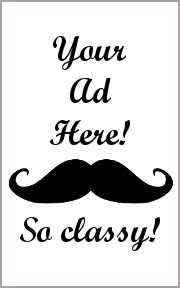 I have corrected the mistake and republished the article.